IntelliSense was unable to determine an accurate completion list for this expression. The provided list contains all identifiers in the file. 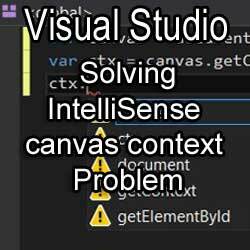 Note: Visual Studio 2015 Community Edition was used for this article. Now, the IntelliSense should not have any trouble detecting the ctx variable as being that of a canvas context, as is demonstrated in the image below. Next, we get the context. I doubt it works. Give us an image which shows getContext() for ctx. I have updated the article to show the Intellisense example when using getContext() method.